When it’s windy I really struggle with my ball striking. What can I do to hit better shots in the wind? The first thing you should do before each shot you play is assess where exactly the wind is coming from and with what strength. To do this simply throw up some grass to see which direction the wind is blowing from where you are, and how far the grass is being blown away from you. Then have a look at the trees near where you hope your ball is going to finish and see what the wind is doing there. Lastly, if it’s a shot at the green then look at the flag and see what direction that is being blown. Once you’ve assessed the situation of the wind you should then follow the pointers below to help you hit better shots. 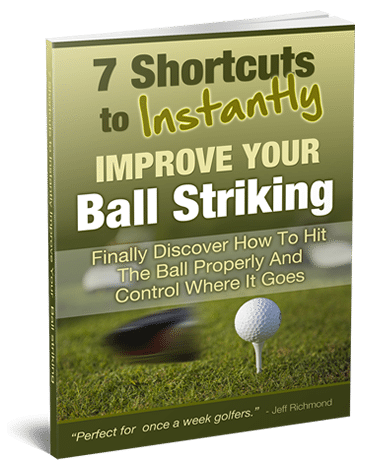 When most amateur golfers are faced with a shot into the wind they swing harder and faster. But this leads to shots that have more backspin (which makes the ball balloon up into the wind), and shots that end up well short of the intended target. Instead, what you should do when playing into the wind is to take one, two or even three clubs more than usual (depending on the wind strength) and swing normally. Also grip down on the grip so your swing will be automatically shorter. This is because the shorter your swing the lower the ball will go (generally). Plus, to help you keep the ball lower you should play the ball further back in your stance. And over all shots into a wind, widen your stance because this helps to create better balance and it also lowers your center of gravity, which can only help. Now here is a great suggestion if you’re playing into extreme wind conditions. On your backswing have no wrist break at all and do the same on the follow-through. This is like a very long putting swing. You’ll have to practice this quite a bit to get used to it, but by swinging like that it puts very little backspin on the ball and the shots start out very low and stay low. This is an advanced technique and should only be used when the wind is extreme. When you’re faced with a shot that has a side wind then you have two options. 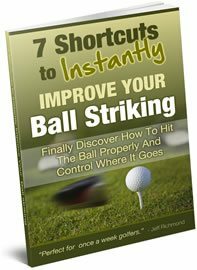 You can play your natural ball flight and either ride or fight the wind, or you can purposely curve the ball to either go with the wind or go into it. There is no right or wrongs here so you must see what works best for you by practice and experimentation. In these situations you should use the wind and get the ball up as soon as possible. If you don’t hit your driver particularly high then use a 3 or 5 wood instead. Let the loft of your club get your ball up in the air and by all means tee the ball higher. Also, expect the ball flight to be a lot straighter than normal. So if you normally have quite a big fade or draw on your shots then when you’re hitting downwind the ball will not curve nearly so much as normal. So that’s some good suggestions on how to play better shots in the wind. One last point I need to mention is that everyone finds it more difficult playing in the wind. So don’t beat yourself up if a few shots, or even more than a few, go astray because the same thing is going to happen to everyone else. Expect the scores to be higher and go out on the day with a positive attitude.